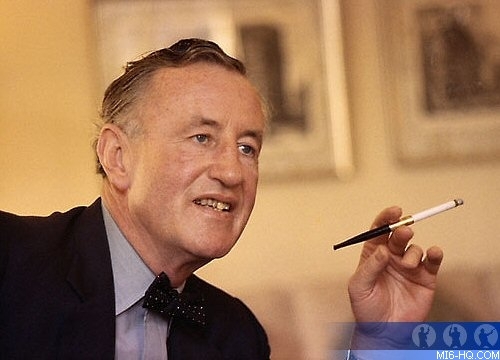 Ian Fleming's Kentish connections were celebrated yesterday evening at the Whitstable Literary Festival, which presented talks by Young Bond author Steve Cole, Fleming biographer Andrew Lycett, and historian Matthew Parker. The audience was also privileged to see Fleming's step-daughter, Fionn Morgan, in conversation with Andrew Lycett. The festival coincided with the publication of the latest Young Bond adventure, Heads You Die, and so fittingly Steve Cole was on hand to discuss the book and the ideas behind it, and reveal some of the secrets of the next book. During a very entertaining hour, Steve Cole talked about the nature of spying and gadgets, and reminded the audience that the most useful gadget a spy could have today is the mobile phone. He also spoke about his research into diving, which in the 1930s was still an experimental and dangerous hobby, and naturally features prominently in the book. Steve Cole revealed that his previous book, "Shoot to Kill", was set in Hollywood because the book was the sixth Young Bond adventure, just as "Dr No" was the sixth (adult) Bond novel. And as "Dr No" was the first Bond film, Young Bond would go to Hollywood. So much for my theory that the story was inspired by the 1930s' California of Raymond Chandler, whose work Fleming admired enormously. More excitingly, Steve Cole let the audience into a secret: the title of the next Young Bond novel, to be published in the autumn, will be "Strike Lightning". A projected image of the temporary cover showed the use of a lightning flash symbol within the title. The symbol recalled Nazi imagery, giving us a hint that in the adventure, Bond will be encountering Nazis, as the Young Bond timeline draws ever closer to the start of the Second World War. Steve Cole also revealed that the Tatra - the ill-fated Czechoslovakian car of the 1930s and favourite of German officers - would feature in the book. Later in the evening, Andrew Lycett spoke about Ian Fleming's life, his contradictory personality, his family background, his love affairs, his relationship with Ann O'Neill, whom Fleming was to marry, and of course his creation of, and feelings towards, James Bond. We also heard about Fleming's connections with Kent. Noël Coward had cottages on the coast at St Margaret's Bay near Dover, which Ian and Ann rented to escape attention and gossip. Locations here would feature in "Moonraker", and Fleming's journeys between London and the coast would be followed by Bond in "Moonraker" and "Goldfinger". Ian and Ann subsequently had a house at Bekesbourne near Canterbury (a city which featured in Ian Fleming's children's book, "Chitty Chitty Bang Bang"), and Ian was a frequent visitor to the Royal St George's Golf Club, which was immortalised in "Goldfinger" as Royal St Mark's. Matthew Parker, author of "Goldeneye: Where Bond was Born", spoke about Jamaica of the post-war years, the everything-goes attitude of the ex-pat and jet-set community, the deep divisions between the ruling white elite and the black population, the shocking racism, and the impact of independence in 1962. Matthew Parker also spoke about Fleming's love of nature, particularly birds and fish, and Fleming's affair with Blanche Blackwell. The final event was an absolute treat: Andrew Lycett in conversation with Fionn Morgan, Ian Fleming's step-daughter. In a series of touching and crystal-clear recollections, Fionn spoke about her fondness for her step-father, Ian's melancholia, and about some of the many enjoyable times they spent together (they would, for example, often eat kippers and buttered brown bread together at Victoria station). Fionn fiercely defended Ian against the view that he had been a bad father to her step-brother, Caspar, and revealed that she had never read a Bond book (although she did attend a private showing of the film, "Moonraker"). Fionn also announced that she's working on a book charting the relationship between Ian and her mother, Ann, based on their letters. That will certainly be essential reading. 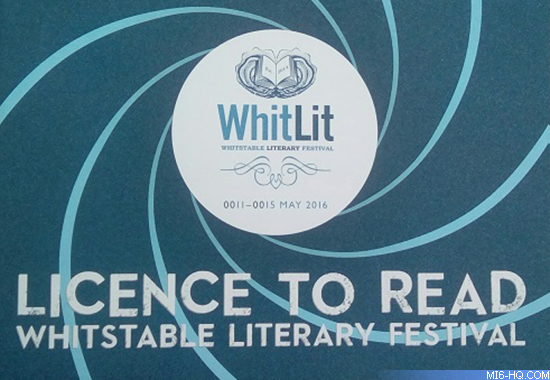 Overall, the Fleming evening at the Whitstable Literary Festival was huge success, and left me (dare I say it) shaken and stirred. Now, where's my copy of Moonraker? First published on James Bond Memes. Republished with permission.